Allan Stanley was a 1981 NHL Hockey Hall of Fame inductee and a veteran of 21 NHL seasons from 1948 to 1969. He played in a remarkable total 1,244 games with 5 NHL teams, scoring 433 points on 100 goals and 333 assists. 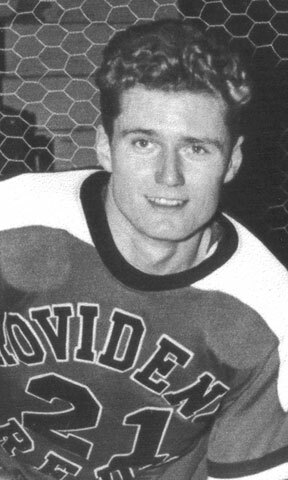 Stanley played three seasons on the blueline with Providence from 1946 to 1949, scoring 24 goals and 85 points in 145 games. He skated with the Reds’ in their win of the 1948 Calder Cup. The Reds owned Stanley’s contract when the New York Rangers came calling to acquire Allan’s services. The team dealt him for the sum of $70,000, big dollars at mid century. He later skated with the Black Hawks, Bruins and Maple Leafs. Affectionately labeled “Snowshoes”, Stanley was a strong, stay-at-home defender. He was a member of all four Toronto Stanley Cup teams in the 1960’s playing on what many consider the best defensive unit in NHL history, alongside Tim Horton, Carl Brewer, Booby Baun and Marcel Pronovost. He retired in 1969 at age 43.